We all make mistakes. This story is from that category, Errors Only Made Once. Have you ever been on a cruise? Have you ever bought a drink or two on a cruise? Having gone on a few in the past, I refused to shell out big clams for cocktails. Rip off! 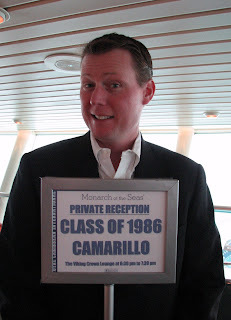 It was the year our large group of friends were all turning forty and thirteen couples celebrated with a mini-cruise to Mexico. I was scheming on how I could get the Captain on board with us. That would be our friend, Captain Morgan. The day before we set sail, I came up with the brilliant idea to fill the contact solution bottle with rum. After filling ‘er up, I tucked the bottle into my bathroom bag and set out a new unopened bottle for my husband, whom I had not shared my genius idea with … yet. Coming home from a long work day, Ralph went straight upstairs to remove his lenses. I knew something was terribly wrong when, from downstairs, I heard him shrieking. Okay, more like a really loud, angry, sort of screeching. I ran upstairs, fast as a bullet, fearing for his eyes and my life. He had bypassed the new unopened bottle of solution and dug into my bathroom bag. His thinking, "Why open a new bottle when there is an opened bottle around here somewhere. Must use every last drop." While I am thinking, "Why be conservative with stupid contact solution? OPEN THE NEW BOTTLE RIGHT IN FRONT OF YOU! It's okay to have two open solution bottles at the same time!!" He innocently lubed-up his eyeball with Captain Morgan’s Spiced Rum! It was a modern-day “I Love Lucy” episode and what I would have given for a diverting knock on the door from Fred and Ethel. I had some splain’n to do! I felt terrible! Terrible! I took the saying “You always hurt the ones you love” to a whole new level. THIS is the kind of mistake you only make once. I apologized profusely as he rinsed out his eye, waiting for the burning pain to end. I begged him to see the humor in it. He was not laughing, as the humor angle was not easily seen during the chaos. Time passed. Being the amazing, understanding, best-husband-in-the-world, he did forgive me and we laughed about it all the way to Mexico. You can see by the picture of Ralph on the cruise, that he was fine...especially after he put a few squirts of “contact solution” in his Coke! I'm going to be laughing about this for a while!